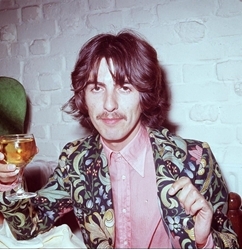 Unreleased song by Beatles legend George Harrison set to fetch £15,000 at auction. Beatles Radio: The Beatles, Solos, Covers, Birthdays, News The Fab 4 and More! AN unreleased track by Beatles guitarist George Harrison is to be auctioned along with a series of unseen images of the band. The secret 1968 song, Hello Miss Mary Bee, comes on a reel-to-reel tape which also includes alternative recordings of several Beatles hits. Unheard by fans, the Indian-influenced track was written for Harrison's good friend Mary Bee and produced around the time of his first solo album, Wonderwall Music. It comes with letters from Harrison to Miss Bee while he was in India with wife Pattie Boyd.